Macro or close-up photography is not limited to those with big budgets and expensive macro lenses. 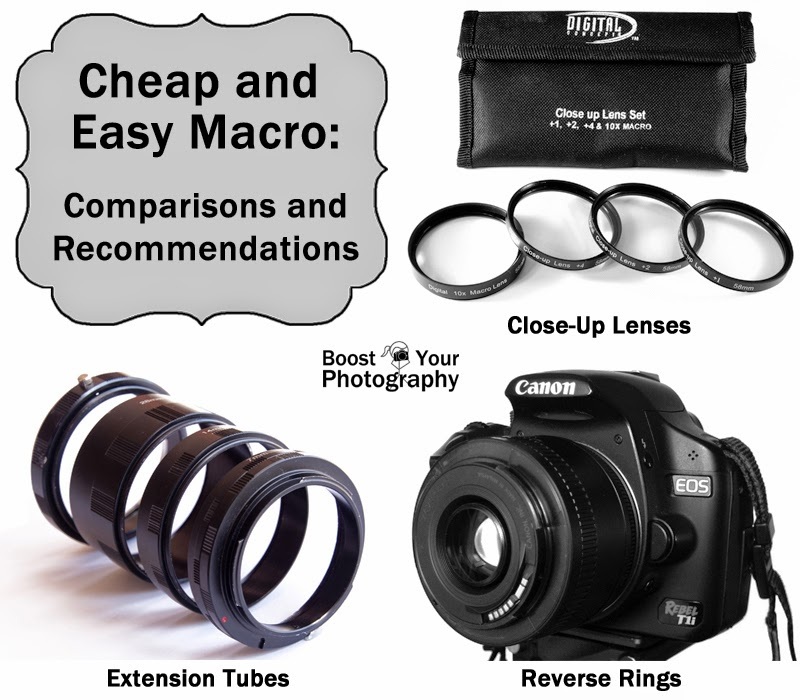 There are several easy and inexpensive ways to achieve macro-level results with your current DSLR camera and lens, and I have written a series of articles that explains each of these techniques in detail (close-up lenses, reverse rings, and extension tubes) as well as tips about how best to use them. This article will provide a comparison of these techniques, so that you can figure out which are right for you. If you want to explore more, one book that has come highly recommended is Understanding Close-up Photography: creative close encounters with or without a macro lens by Bryan Peterson. First, you should evaluate your current macro capabilities. One often overlooked method for close-up photography is to use your longest zoom lens. Figure out the minimum focusing distance of your lens (the closest you can get to your subject and still have it in focus), which is often written on the lens itself. (On Canon lenses it is the length written after the flower symbol.) Then, pick a subject at that minimum distance, zoom your lens out to its longest zoom, and see how close-up of an in-focus image you can capture. This is your starting point for macro photography. 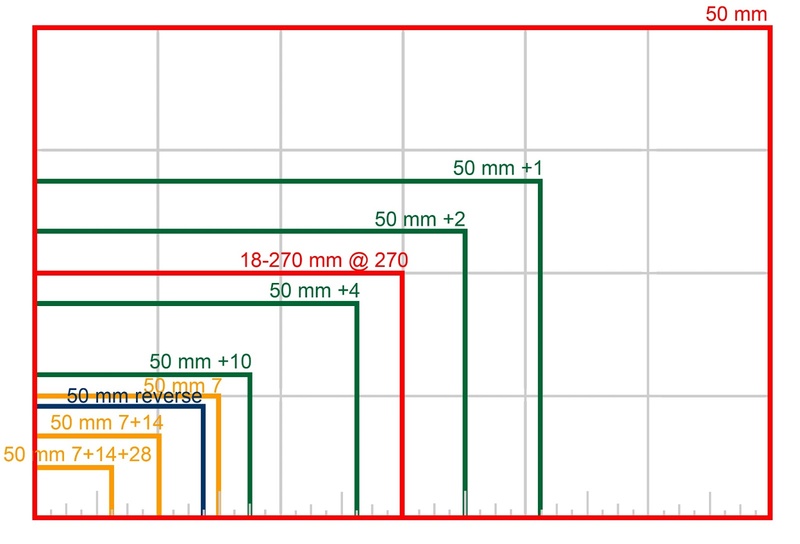 Tip: if you really want to know how close of an image you can make, take a photograph of a ruler. 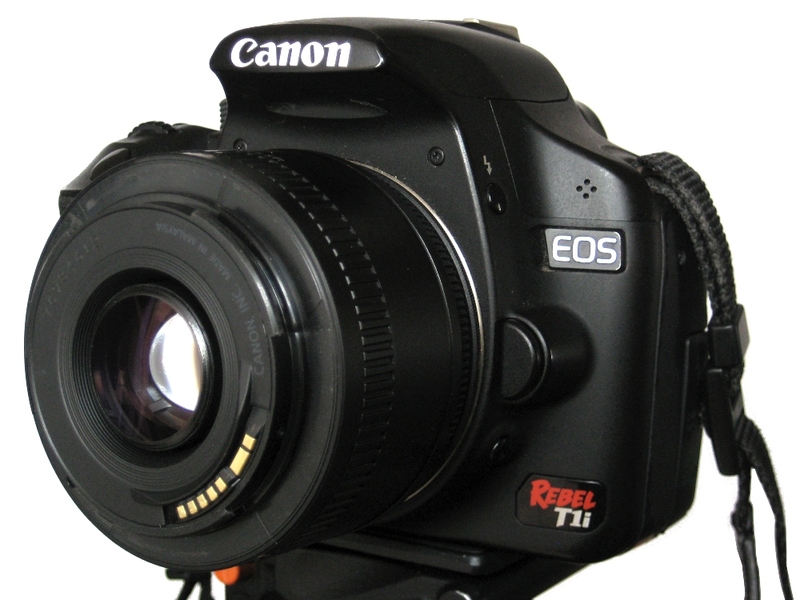 A reverse ring mount adapter allows you to secure your lens backwards to your camera body, and this reversal of the optics allows for close-up photography (read the full article about reverse rings here). You will lose autofocus with a reverse ring and will have to set the aperture of the lens before reversing it. 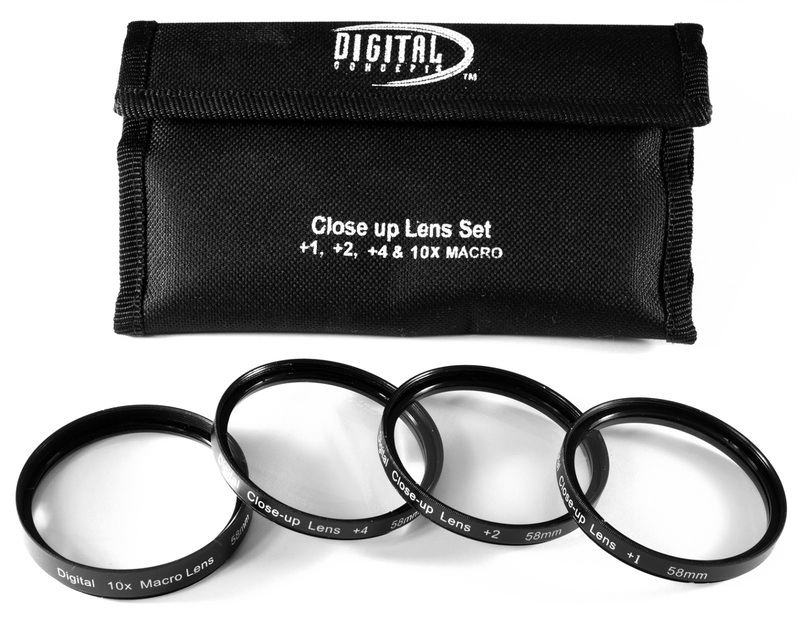 Reverse rings work best if you have a prime lens, and you must purchase a separate reverse ring that matches the filter diameter of each lens you plan to reverse. (Shop for reverse rings on Amazon.) 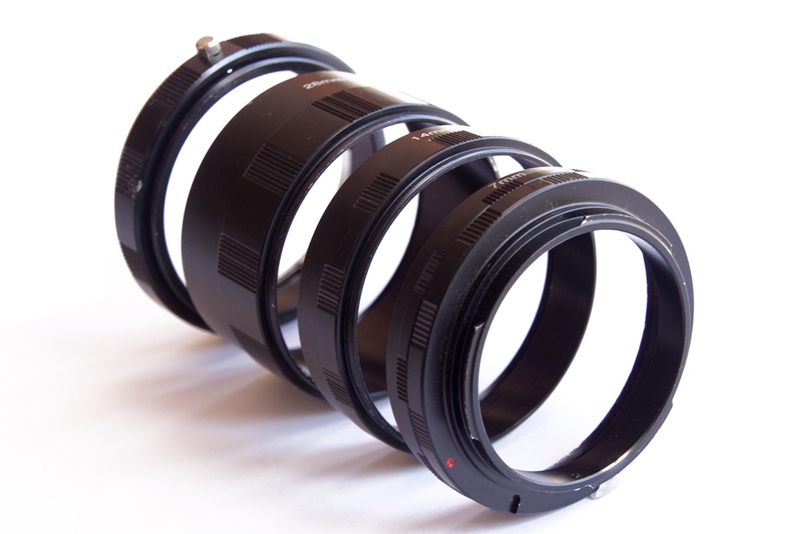 Excellent prime lenses include the Canon 50 mm f/1.8 or the Canon 35 mm f/2. The big question in macro photography is always how close-up of an image you can take. The definition of true macro photography is the ability to capture an image the same size as the sensor of the camera, indicated as a 1:1 ratio, or better. For reference, my Canon T1i camera has an APS-C sensor that is approximately 22.3 x 14.9 mm (0.87 x 0.59 inches), which means I would need to capture an image of that size or smaller to be true macro. Practically speaking, however, most photographers are happy to capture an image that appears to be life-size or larger-than-life when viewed at a standard print size like 4 x 6 inches. The chart below is a rough approximation of how close-up of an image you can create using each of the different techniques. The grey grid in the background is in inches, and the outside red rectangle represents the regular field of view for the Canon 50 mm lens: 4 x 6 inches. An image captured at that point would be exactly life-size when printed as a 4 x 6. Not true macro, but a good starting point. The interior red rectangle represents the field of view for the Tamron 18-270 mm lens zoomed out to 270 mm: 2.5 x 3.5 inches, which would create an image almost twice life-size when printed as a 4 x 6. The series of green rectangles represents the effect on the 50 mm lens of each of the four strengths of close-up lens: +1, +2, +4, and +10. These differing strengths are particularly useful if you want to capture a composition of a specific size, such as an entire Lego minifigure. If you just want the closest image you can capture, use the +10 (or try a combination). The series of yellow-orange rectangles represents the effect on the 50 mm lens of successively adding each of three widths of extension tubes: 7, 14, and 28 mm. The 7 mm extension tube alone has the most dramatic impact, bringing the area captured even closer in than the close-up lenses. Adding additional extension tubes result in even closer images. The blue rectangle represents the area in focus when the 50 mm lens is reverse-mounted on the camera body. This is close to half life-size when compared to the size of the sensor. In my experience, I find that I reach for my close-up lenses the most often, then the extension tubes, and then the reverse ring. The close-up lenses are quick, easy, simply screw in to the front of the lens, and you can use different strengths depending on what you want to accomplish with your composition. There is a minimal impact on the amount of light reaching the sensor, so you can more easily shoot hand-held. You can also easily take them on-and-off in the field without worrying about dust or debris getting into the camera body. The extension tubes are most useful when you want to get as close as possible to something. Because each successive tube diminishes the amount of light reaching the sensor, however, it is more difficult to hand-hold without strong lighting, a wide aperture, or bumping up the ISO. I recommend using extension tubes indoors, where you can be less concerned when constantly removing and replacing the lens. The reverse ring is useful when you want to get a very close-in image without getting as close to the subject itself. I have found that the minimum focusing distance is greater when using the reverse ring than with extension tubes, meaning that you can be further away from the subject while still capturing a close-up image. This is particularly useful when photographing something skittish, like an insect, that might respond if you get too close. Each of these techniques is easy and inexpensive, and $10-15 can get you started with any one of them. Below are the specific brands that I use and would recommend, but make sure that you get the correct size for the filter diameter of your lenses and/or the model of your camera body.